The persistent weakness of inflation has been a much commented on feature of the global economy in recent years (IMF 2016). While much analysis has focused on the challenges for monetary policy in developed market (DM) economies presented by low inflation, the declines in inflation have typically been larger in emerging market (EM) economies (Daly and O’Doherty 2018). 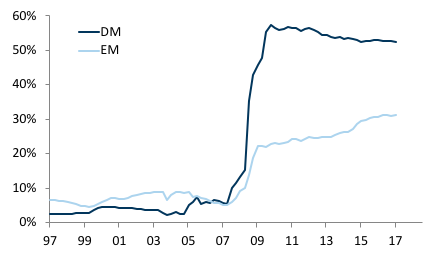 EM inflation rates have converged towards DM rates. The gap between median inflation rates in DM and EM economies has fallen materially, from 10-15 percentage points in the first half of the 1990s to 2-3 percentage points from the early 2000s onwards (Figure 1).1 The gap has remained relatively stable since then, despite the occurrence of the Global Crisis and a number of EM-specific shocks (such as the 'Taper Tantrum'). In 2017, the difference in median inflation rates was 1.7 percentage points. Inflation convergence between EM economies. There has been a significant convergence in inflation rates between emerging economies, with EM economies that have historically had high inflation experiencing larger declines in inflation rates on average than those which have had relatively low inflation. Figure 2 displays the interquartile range between high- and low-inflation EMs, which fell to an all-time low in the second half of 2017. Geographical convergence. Related to the convergence between high- and low-inflation EM economies, there has also been a geographical convergence in inflation rates, with regions that have historically had high inflation (LATAM and much of CEEMEA)3 witnessing larger declines than regions that have had a longer history of relatively low inflation (Emerging Asia and DM economies; Figure 3). 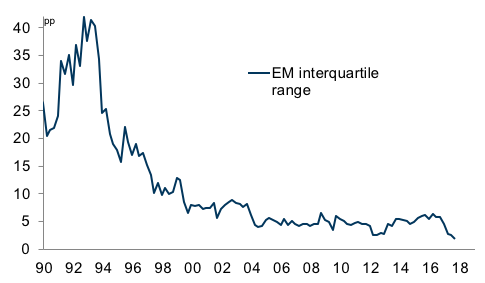 Much of the initial convergence in EM inflation rates took place in the late 1990s and early 2000s. However, in the period since the Global Crisis, this improved inflation performance has been sustained, even as unemployment in many of these economies has fallen to record lows. 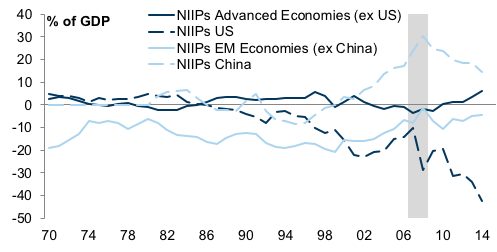 The combination of record-low unemployment rates, together with low and stable inflation rates, implies that there has been a sizeable structural improvement in price Phillips curves in EM economies. In common with many developed economies, the relative importance of domestic labour market pressures in determining inflation outcomes in emerging economies appears to have decreased. The link between unemployment and inflation is superficially less clear in EM than in DM economies. There is a clear Phillips curve relationship for DM and, to a lesser extent, CEEMEA economies, albeit one that has shifted and flattened over time. However, based on the simple scatter plots set out in Figure 4, there is less of a discernible pattern in the relationship between unemployment and inflation in LATAM and Asian economies. There has been a broad-based improvement in the trade-off between unemployment and inflation across EM and DM economies. 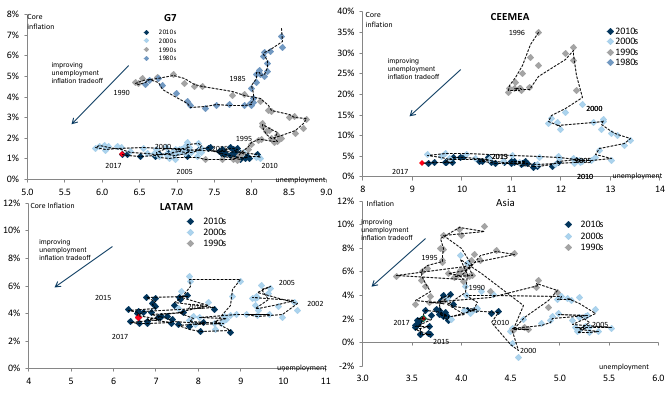 The south-westerly progression of the dots in each of the panels implies a sustained structural improvement in the trade-off between unemployment and inflation, with the majority of economies combining unusually low levels of both unemployment and inflation. The change in this relationship appears to have been particularly marked in the period since the Global Crisis. In Figure 5, we display our estimates of the marginal effect of the unemployment gap on core inflation, both on a rolling 10-year basis and across the samples as a whole.6 To generate regional estimates, we average the individual regression results for each of the countries in each region. Across EM countries, the relationship between unemployment gaps and core inflation appears less stable over time than for DM economies (the estimated coefficient on unemployment is more volatile and the confidence intervals much wider). However, it is notable that, once we have adjusted for changes in the nominal effective exchange rate (NEER), the average Phillips curve coefficient is similar in all four regions. This suggests that the apparent weakness of the link between unemployment and core inflation in EM economies in Figure 4 partly reflects the effect of exchange rate volatility in disguising that link (i.e. one reason why the link between unemployment and inflation is superficially clearer in DM than EM economies is because DM exchange rates tend to be more stable). 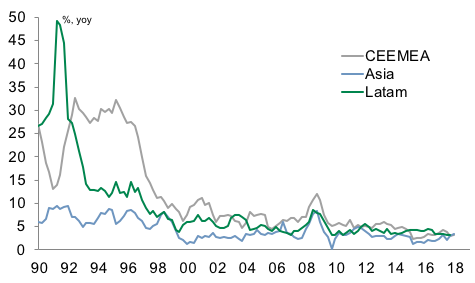 There has been a distinct weakening in the effect of unemployment gaps on core inflation over time in the G7 and CEEMEA economies (i.e. price Phillips curves appear to have flattened). 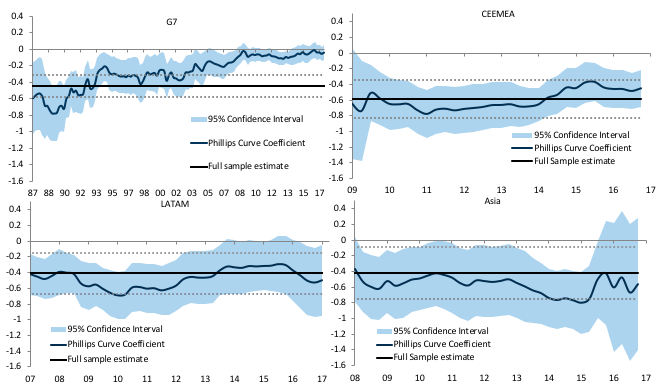 This flattening is less clear in LATAM and Asia, although the confidence interval around the estimated coefficient on unemployment gaps widens significantly in the most recent data in both regions. While the importance of domestic labour market pressures in driving inflation appears to have decreased, there is tentative evidence that the relative importance of global factors in determining inflation in EM economies has increased. Figures 6 and 7 display how the importance of global/common factors in determining inflation in DM and EM economies has evolved over time, using two different methodologies. Figure 6 displays how much of the variance in inflation in each country is explained by the first common factor, using headline and core (year-on-year) inflation rates at a quarterly frequency over a rolling 10-year window.7 Reflecting the rise in commodity price volatility since the Global Crisis, the increase in the importance of global factors in explaining headline inflation rates has been particularly marked. 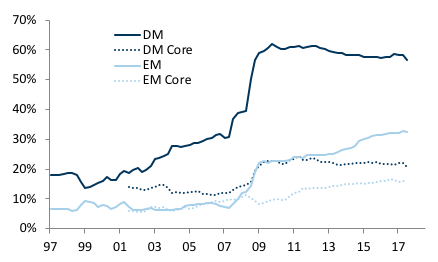 However, the importance of global/common factors in explaining core inflation rates in DM and EM economies has also risen over time, albeit from a lower level. In Figure 7, through the use of 10-year rolling regressions using year-on-year data, we calculate how much of the variance in each individual country’s headline rate is explained by world headline inflation. This exercise also points to a secular increase in the importance of global factors. Increased monetary policy credibility. From the late 1990s onwards, an increasing number of EM central banks adopted inflation targets, boosting the credibility of EM monetary policymaking. The list of EM economies adopting inflation targets during this period includes Poland (1999), Brazil (1999), South Africa (2000), Hungary (2001) and the Philippines (2002), among others. This progression to inflation targeting mirrored a similar move in DMs from the late 1980s onwards. Clearly, the success with inflation targeting has varied across EM economies, but the widespread adoption of inflation targets contributed to an increase in average monetary policy credibility and a reduction in average inflation rates. Figure 8 displays the decline in 1-year-ahead consensus inflation expectations for EM economies that has taken place since 2000. A reduction in the frequency of EM crises, owing to increased balance sheet resilience. There has been a reduction in the frequency of EM currency crises, reflecting a secular improvement in EM balance sheets (Lane and Milesi-Ferretti 2017, Bernini and Daly 2017), with rising net international investment positions and a shift from debt-based to equity-based financing (Figure 9). 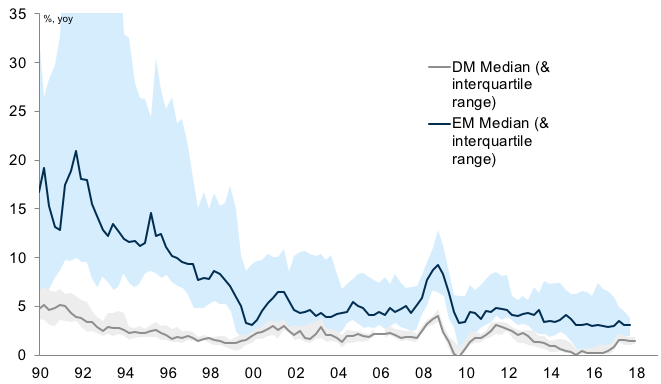 Looking forward, in the absence of a substantial reduction in EM monetary policy credibility and/or a deterioration in EM balance sheets, we believe that the likelihood of a broad-based divergence between EM and DM inflation rates is low. If strong global growth is sustained, we expect that global reflationary pressures will increase and inflation in EM economies will gradually rise. But we expect rising inflationary pressures to be a global rather than EM-specific phenomenon. Bernini, A and K Daly (2017), “Financial integration and net international investment positions before and after the Global Financial Crisis”, EM Macro Themes, Goldman Sachs, 24 March. 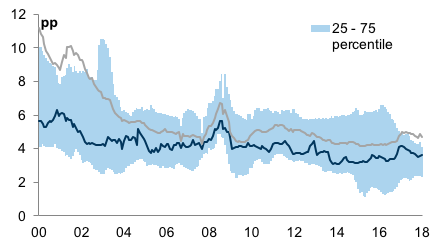 Daly, K and L O’Doherty (2018), “The convergence in EM inflation”, EM Macro Themes, Goldman Sachs, 27 January. IMF (2016), “Global disinflation in an era of constrained monetary policy”, World Economic Outlook, October. Lane, P and G M Milesi-Ferretti (2017), “International Financial Integration in the Aftermath of the Global Financial Crisis”, IMF Working Paper 17/115. Mano, R and M Castillo (2015), “The level of productivity in traded and non-traded sectors for a large panel of countries”, IMF Working Paper WP/15/48. The developed market economies included in Figures 1-3 are Australia, Canada, Japan, Norway, Switzerland, the US, Austria, Belgium, Denmark, Finland, France, Germany, Greece, Ireland, Italy, Netherlands, Portugal, Spain, Sweden and the UK. The emerging market economies included are Argentina, Bolivia, Brazil, Bulgaria, the Czech Republic, Chile, China, Colombia, Dominican Republic, Ecuador, Egypt, Hungary, India, Indonesia, Iran, Jordan, Korea, Malaysia, Mexico, Nigeria, Pakistan, the Philippines, Peru, Poland, Romania, Russia, South Africa, Taiwan, Thailand and Turkey. The Balassa-Samuelson effect arises from the impact that rapid productivity growth in tradable sectors (such as manufacturing) has on inflation in non-tradable sectors (such as restaurants). Rapid productivity growth in tradable sectors will tend to boost wage growth across the economy, raising prices in non-tradable sectors where productivity growth tends to be low. With whole-economy productivity growth averaging around 1-1.5pp higher in EM than DM economies, a back-of-the-envelope calculation implies an average B-S effect of 0.5-1.0pp on EM vs DM inflation (this assumes: i) a tradable goods share of GDP of 55% and 45% within EM and DM respectively; and ii) productivity growth of 0.0-0.5% per year in non-tradable sectors). This estimate is comparable to the results obtained by a recent IMF study (Mano and Castillo (2015)). The B-S effect can also operate via the nominal exchange rate, so the 0.5-1.0pp estimate is an upper limit of the effect on inflation. CEEMEA includes Central and Eastern Europe, the Middle East and Africa. The sample that we use for these comparisons is smaller than was used in Figures 1-3. For CEEMEA, we include Russia, South Africa, Turkey, Poland, Hungary and the Czech Republic; for LATAM, we include Brazil, Mexico, Chile, Peru and Colombia; and for Emerging Asia, we include China, the Philippines, Malaysia, Taiwan and Thailand (we do not include India owing to the limited history of unemployment data for that economy). Given the limited history of core inflation measures for many Asian economies, we use headline inflation for this group. We regress (changes in) core inflation on a 5-year moving average of past core inflation (which we use as a proxy for slow-moving inflation expectations), the unemployment gap (which we calculate as the standardised difference between current unemployment and its Hodrick-Prescott trend) and changes in the nominal effective exchange rate (NEER) (to adjust for the effect of import price shocks on inflation). The estimation is based on quarterly data, with the same regression structure for each economy and up to three lags in the slack and NEER terms. Owing to differences in data availability, our sample starts from 1978Q1 for DM economies, 2000Q1 for CEEMEA, 1998Q1 for LATAM and 1999Q1 for emerging Asia. We calculated the first factor in headline and core year-on-year inflation rates across 42 countries. We then used rolling 10-year windows to calculate how much of the variance within each country’s inflation rates over time is explained by the common factors. A simple average of the R2 statistic was taken across both DM and EM countries. Factor Analysis is a purely statistical technique, and results using overlapping observations should be interpreted cautiously; however, for the purpose of considering the changing relationship over time, the results are suitably robust.